Dimensions 1.25 by 8.25 by 10 in. Amazon.com description: Product Description: In this James Beard Award-winning cookbook, George Greenstein reveals 125 recipes for the yeasted and quick breads that have been handed down through his family by three generations of bakersâthe breads that made his bakery so well-loved for so many years. For more than twenty years, Greenstein owned and operated a Long Island bakery that produced a wide variety of baked goods, from many different ethnic traditionsâfocaccia and Irish soda bread, Bavarian pumpernickel and naanâincluding many from his own culture, such as Jewish corn bread, challah, and bagels.Â Now that most neighborhood bakeries like Greenstein's are long since closed, this classic collection not only teaches bakers everywhere how to make those delicious, classic breads, but it also preserves authentic versions of the recipes for all to enjoy. With the same helpful features that made this a cherished cookbook upon its original publicationâseparate instructions for mixing each recipe by hand, food processor, and stand mixer; tips for baking a week's worth of bread in as few as two hours; invaluable baker's secrets; and a very approachable style throughoutâthis revised edition also includes twelve new recipes to satisfy both old fans and new. So bring the spirit of that great old bakery back to life right in your very own kitchen, filling every room of your house with the wonderful aroma of freshly baked bread. 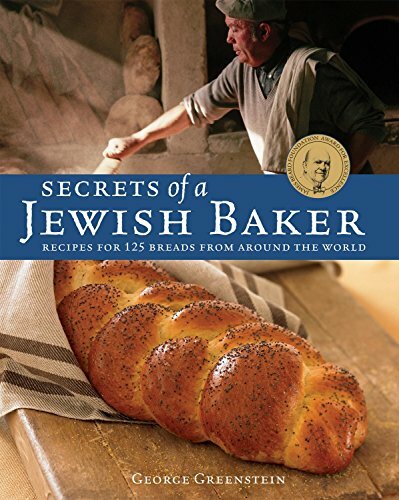 And rest assured you'll bake with ease and success every time, thanks to George and his long-learned, very happily shared SECRETS OF A JEWISH BAKER. About: In this James Beard Award-winning cookbook, George Greenstein reveals 125 recipes for the yeasted and quick breads that have been handed down through his family by three generations of bakers—the breads that made his bakery so well-loved for so many years.